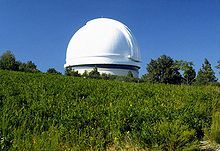 Observatorio Palomar cerca de San Diego, California, donde Carolyn y Gene Shoemaker registraron muchos de sus descubrimientos astronómicos. Página en la U.S. Geological Survey sobre Carolyn Shoemaker, en inglés. ↑ Stange, Mary Zeiss; Oyster, Carol K.; Sloan, Jane E. (23 de febrero de 2011). Encyclopedia of Women in Today's World. SAGE Publications. p. 1344. ISBN 9781412976855. Consultado el 22 de junio de 2018. ↑ Mestel, Rosie (9 de julio de 1994). «Carolyn Shoemaker and 'Her Comet'». New Scientist 143 (1933). p. 23. ↑ a b c d e f g h i j k Chapman, Mary G. (17 de mayo de 2002). «Carolyn Shoemaker». Astrogeology Science Center. USGS. ↑ a b c Wayne, Tiffany K. (2011). "Carolyn Shoemaker". Encyclopedia of Women in Today's World, Vol. 4. Thousand Oaks, Calif.: Sage Publications. ↑ a b «She's Looking Out for Us». Explorer (American Association of Petroleum Geologists). May 2001. ↑ a b c Lang, Susan S. (11 de abril de 2002). «Comet hunter Carolyn Shoemaker to speak at Cornell April 21». Cornell Chronicle. ↑ Shoemaker, Carolyn (27 de noviembre de 1998). «Space—Where Now, and Why?». Science 282 (5394): 1637-1638. Bibcode:1998Sci...282.1637S. doi:10.1126/science.282.5394.1637. ↑ «James Craig Watson Medal». National Academy of Sciences. ↑ «4446 Carolyn (1985 TT)». p. Minor Planet Center. ↑ «Minor Planet Discoverers». 4 de septiembre de 2016. p. Minor Planet Center. Esta página se editó por última vez el 7 mar 2019 a las 12:06.